Emek’s style instantly stood out when I walked in the gallery. His images are often very detailed have powerful messages. This is a poster done a few years ago for “Queens of the Stone Age”. Although it’s advertising for a band’s show, it’s certainly expresses a strong viewpoint of our government. Right away, you can see that the politicians are shown as “dumb apes”. The peace signs on the missiles are intriguing. (A great poster already, it caught my eye and influenced me to examine further.) At the top it says, “Lullabies to paralyze”. This confirmed my assumption that the peace signs on the missiles are describing how the white house will tell us everything that we want to hear and promise peace, but they just cause more destruction and peace is never achieved. Even simpler, they label harm with “peace”. The missiles don’t necessarily have to be literal either, such as war. Simply think of the missiles as their solutions to issues and the consequences involved. 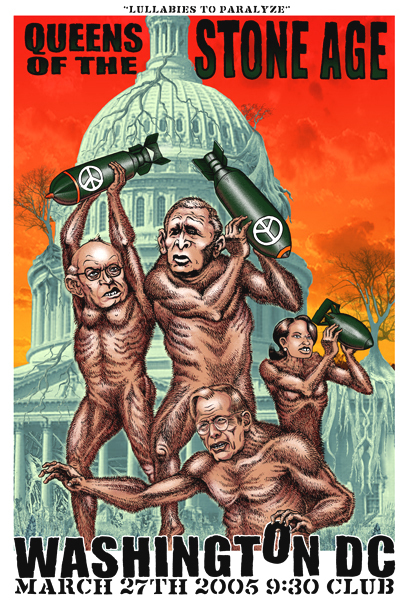 Emek did a great job (to say the least) depicting that concept. More on this topic can be found here. As far as the layout of the poster and such, I really enjoy how the type is involved with the characters by the ape grabbing the O. Not sure if that letter has any significance? If you figure it out, let me know. Emek also keeps your eyes moving throughout the poster with the use of color, implied motion of the apes as well as their negative spaces between them.